Contains: Organic Coriandrum sativum leaf tincture, distilled water, and organic grain alcohol. Contains: standardized extracts of Amalaki, Emblica officinalis; Manjistha, Rubia cordifolia; Turmeric, Curcuma longa; Guduchi, Tinospora cordifolia; Anantmul, Hemidesmus indicus; Vidanga, Emblia ribes; Licorice, Glycyrrhiza glabra. Contains: Guduchi herb, Tinospora cordifolia; Bhumy Amalaki herb, Phyllanthus fraternus; Kutki root, Picrorhiza kurroa; Amalaki fruit, Emblica officinalis; Chitrak root, Plumbago zeylanica; Punarnava root, Boerhaavia diffusa; Vidanga herb, Embelia ribes; Manjista root, Rubia cordifolia; Haritaki fruit, Terminalia chebula; Bibhitaki fruit, Terminalia belerica; Coriander seed, Coriandrum sativum; Dandelion root, Taraxacum officinale; Musta root, Cyperus rotundus; Cilantro leaf, Coriandrum sativum; Guggulu resin, Commiphora mukul; reduced iron, Anantamul root, Hemidesmus indicus; Licorice root, Glycyrrhiza glabra; Pippali fruit, Piper longum. 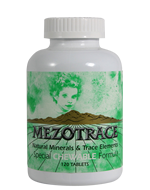 Contains: MezotraceÃƒâ€šÃ‚Â® Chewable Minerals, 120 tablets Calcium 600 mg. 60% Magnesium 400 mg. 100% Iron 1.3 mg. 7% Zinc 1.5 mg. 10% Copper 0.02 mg. 1.25% Selenium 35 mcg. 50% Manganese 0.18 mg. 9% Chromium 16 mcg. 13% Molybdenum 44 mcg. 58% Sodium 1.5 mg. < 1% Potassium 1.5 mg. < 1% Iodine 12 mcg. 8% Bismuth, Boron, Bromine, Chlorine, Cobalt, Fluoride, Gallium, Germanium, Gold, Hydrogen, Lithium, Nitrogen, Silver, Strontium, Sulfur, Tin, Tungsten, Vanadium, Zirconium.